Home/Boats, Chandlery, News, Photos, Windsport Mylor/Boatparking – Not just for dinghies!!! Boatparking – Not just for dinghies!!! The Firebird sports-catamaran is a hot bit of kit around the bouys in Falmouth harbour racing this season. One of the Firebirds from the rejuvenated fleet of now 6 boats based in the harbour required few days of shore based maintenance and rig tuning and the new Windsport widened slipway and large grass boat park was the perfect solution. The transition from mooring to boat park was simple thx to the specially designed trolley cups and a suitable vehicle to help it up the offset slipway. Once in the boat park there was ample room to lower the mast , make adjustments, carryout repairs and modifications. Access to water and electrical power for small power tools is close at hand and the Windsport small boat chandlery and workshop with rigging facilities are right on site. 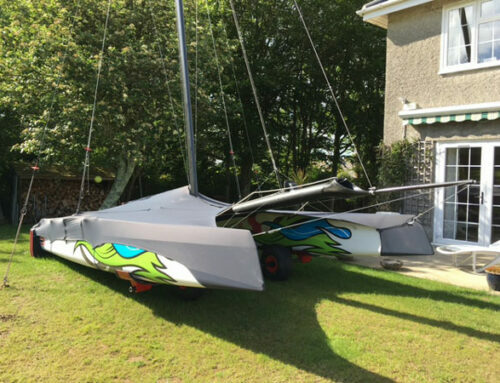 Windsport offer the perfect winter storage facility for boats on trailers or trolleys, Shrimpers, Sports Keelboats, Powerboats, Dinghies and now Sports Catamarans!!! For more information contact Windsport. info@windsport.co.uk 01326 376191.